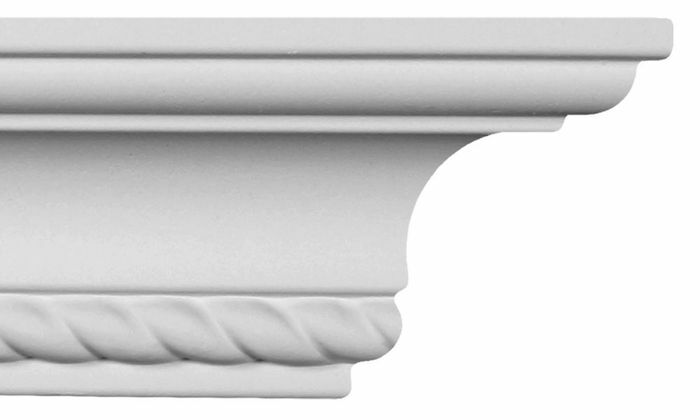 CM-1085 Crown Molding is a Rope, 3-1/8" breadth crown molding typically used in rooms with ceiling heights of 8' - 9'. 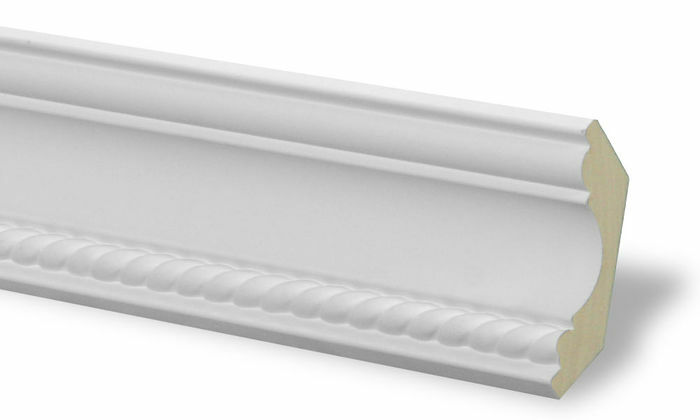 uDecor crown molding is manufactured with a dense architectural polyurethane compound (not Styrofoam). Polyurethane is durable and 100% waterproof. The material can be sanded to shape just like wood. 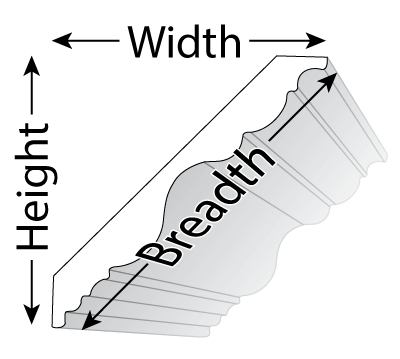 Breadth - the distance between the outer contact point with the ceiling to the bottom contact point with the wall. Width - the distance between the wall and outer contact point with the ceiling. The breadth is the hypotenuse of the right triangle whose legs are the width and the height. When planning for crown molding, inspect the walls and ceiling to see if any vents or other objects are within the footprint of the molding. Consider mitered returns at the ends of any molding runs that may be interrupted by these items. Allow 48 hours for the molding to acclimatize to the conditions where it will be installed. It is easier to paint the molding before installation. Working at waist level is always better than working over your head. 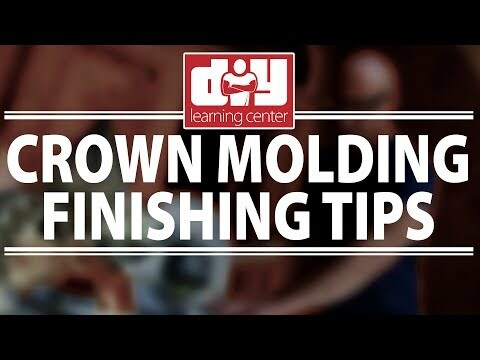 Paint your molding before you start the installation process. Then touch up the imperfections after you are done with the install. ALWAYS test a section with your paint of choice before committing to painting all of your molding. 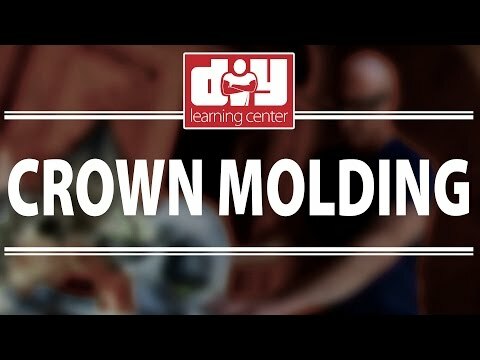 Paint formulations change all the time and you want to be sure there is no adverse interaction between your paint and the primer on the molding. 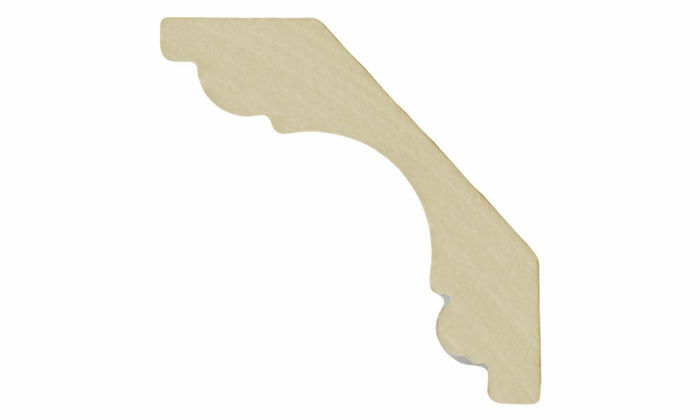 Always use an appropriate amount of adhesive on the end of any of the molding being joined end to end. This prevents the molding from separating as the house walls expand and contract with temperature changes. I am very satisfied with the quality of the product and the shipping was excellent. I will definitely recommend this company for their products. Looks great, very easy to install. Looks so good I'm thinking of doing all the bedrooms. This was the finishing touch our living room needed. It was turned a regular space into something classy. Looking to finish the rest of the house with the same crown molding. The crown molding arrived quickly, is painted and ready to be installed. It will give my home a much richer look. The sample arrived in one day and helped me make my decision. The design is perfect for my mid century ranch. Looks great, reminds me of houses up north. So glad I did this. I now have the Crown molding in all my rooms, it looks like a new house. 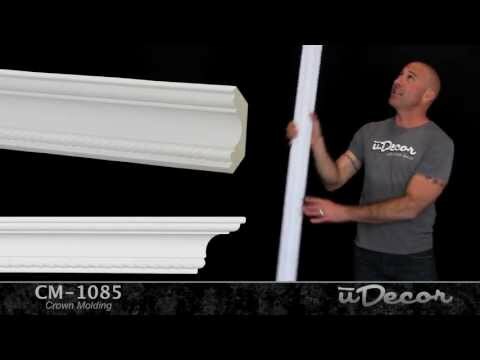 Ok my honest review, I have purchased this product (crown molding) not knowing what to expect I have used wood previously for chair rail but I didn't want to go through expense for crown molding. I happened on this site through searching (google) and figured I would try 1 room. I received the product in a timely manner, painted it and put it up. WOW very impressed with it, looks great and you can't really tell if Poly or other product. Very happy with purchase and I will be doing rest of cielings with it. Can't wait to try other products once I complete this. I'll never use wood again for crown. Easy to install, looks great. easy to cut, easy to install. Perfect. These crow moldings look awesome in my new basement. Only thing you need to be carful about is the inside and onside corner cuts, I ordered a piece extra just to learn cuts. Looks great, everyone loves it. The molding was easy to install and looked beautiful on the ceiling. A big credit to the company was that it came in on the next day of the order. We were happy with the product and its delivery. Great product! Easy to put up and makes the room look complete. Will not hesitate to purchase again. We have redone my entire first floor of my home. When people come over they are amazed at how the crown molding changed the look of the house. The rooms are rich and elegant.